Pop-pop boats have been around for a hundred years or more. While they are true steamboats, they have no moving parts. In the early days of pop-poppery, the German manufacturers often built a thin, flexible metal diaphragm into the water/steam circuit. This diaphragm was dished slightly and, when the water flashed into steam, the diaphragm would spring out, making a noise like a metal cricket that you snap by pressing it with your thumb. That’s how the boat got its common name. Ours works on the same principle but uses a coiled copper tube instead of a diaphragm. 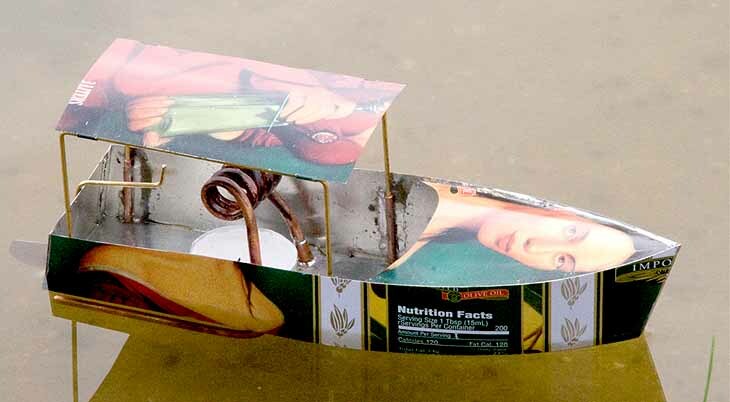 The hull of this boat is made in a single piece, from a single one-gallon can laid out flat. If there is lithography on your can, this can go inside the boat or out —- your choice. Or you could always paint it when you are finished. Enjoy! Hardwood form: 1.75" x 2.2" x 3/4"